Picture: Local Set vs Grey Set – Can you tell the difference? 4th June 2013, Singapore – Recently there has been spates of incidents where the question of buying original sets (distributed by local Sole distributor) versus grey sets (parallel imported sets) were once again posed to the market and put to the test. So how does buying either one stacks up? Well, many will ask themselves, is it worth to buy grey sets at a significantly lower price and take the risk of buying a lemon? Or should they buy locally distributed sets as the additional cash paid gives a great peace of mind should anything (touch wood) goes really wrong. What do you think? I guess the answer will be very much each to his/her own. Let me share an incident that had happened quite a while ago. A buyer walks into a camera store and asked for a lens. Then the buyer bargains and bargains. The shop owners wants the business and what he did was, he took out the Warranty Card from the local set and slipped it into a Grey set box – then sold the lens to the buyer at a really “good” price. The story may have ended there but not in this case. As fate may have it, the set turned out to be a lemon. The lens keep focusing front back erratically. The buyer decided to bring the lens to the local service centre. At the service centre, after letting the customer officer checked the lens, the lens had to be “admitted” for checking by the technician so the procedure of registering the owners’ particulars started. Then the warranty card was produced. The customer service officer checked the serial number on the lens, then on the warranty card – found that it is not the same and alerted her manager. The manager came, took the lens and went to another computer and entered the serial number, then the manager came back to the buyer and informed him that the lens serial number and the warranty card does not matched. And from the system, the lens was also not from Singapore but from Myamar. The buyer flew into a rage. But left the centre after the manager informed him that they will still repair the lens for him – at a cost. Naturally, the buyer call up the shop where he bought the lens and questioned the shop owner. The shop owner simply told the buyer that since he (buyer) wants it cheap, he sold him cheap, everything else is not his problem – then the line went dead. And what happened to the local set that has no more warrranty paper inside the box? Well, the shop owner had called the distributor and claimed that the lenses delivered to his shop were without warranty papers right after he sold that lemon lens. A set of warrranty cards were sent to him hours later following his call. Who is at fault here? The person selling the grey set? The buyer that went cheapo commando? The distributor that replaces the warranty cards too easily? Or is it market forces? I will leave the final answer to be answered by you. Meantime, the photo at the top shows 2 Sigma consumer lenses. On first look, can you tell which box is from the local distributor and which box is parallel-imported? Now take a look at the below photo. Picture: Local Set vs Grey Set – Notice the Box on the left with the Sticker? with some fine text below it. The box on the right does not have a sticker like this on anywhere of the box. The truth, local sets (Singapore & Malaysia) comes with this unique sticker, grey sets don’t. The local distributor for Singapore, Sigma Marketing Pte Ltd shared with us that this sticker is unqiue to Singapore & Malaysia. This sticker were specially produced and printed & added to all Sigma equipments that are distributed by them before each and every single item leaves the warehouse. 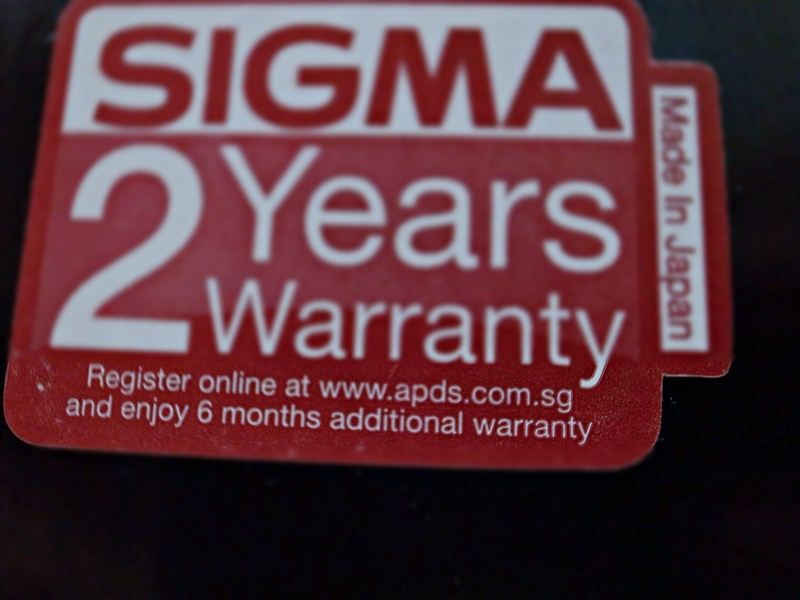 Picture: Local Set distributed by Sigma Marketing Pte Ltd comes with a unique sticker. 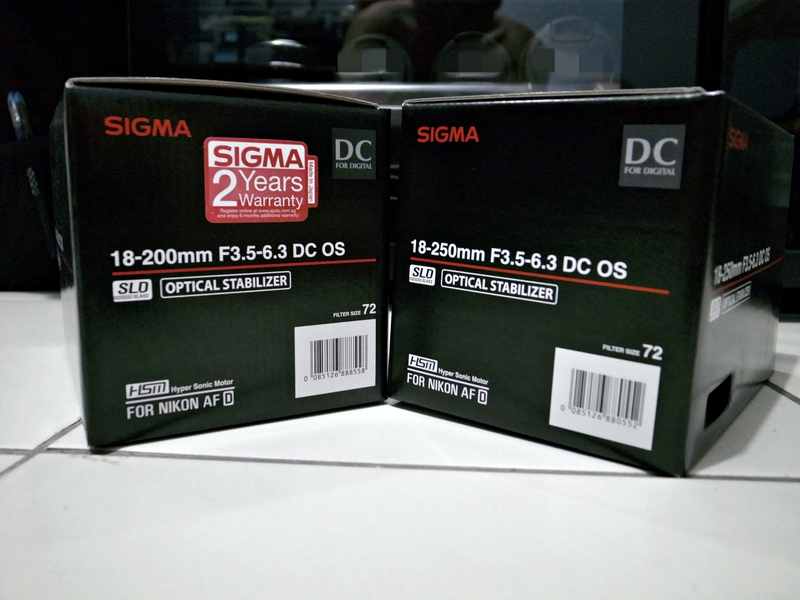 Picture: Local Set distributed by Sigma Marketing Pte Ltd enjoys additional 06 months warranty. the equipment comes with an additional 06 months waranty, now that is really buying with a peace of mind. 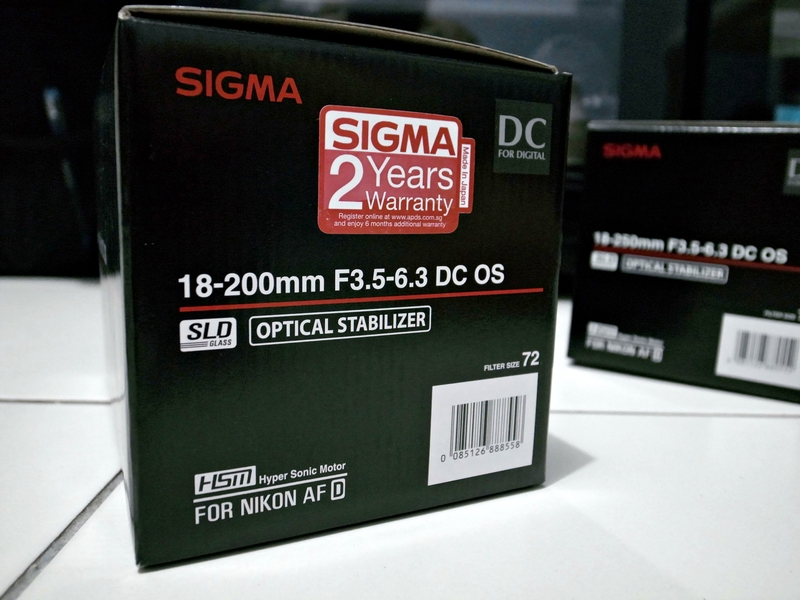 Sigma equipment you are about to purchase is a locally distributed set. And lastly, remember, with demands, comes supply. And the supply can be from various sources. In Singapore, Sigma cameras & lenses are exclusively distributed by Sigma Marketing Singapore Pte Ltd, a subsidiary of Sigma Japan Corporation. This entry was posted in Brand: Sigma, Photography Articles & Videos, Uncategorized and tagged Sigma. Bookmark the permalink.